For problem skin, this therapeutic formulation teams powerful neem with green clay & amla. Perfect for oily skin types, these ayurvedic herbs encourage cleansing, while promoting health & vitality. 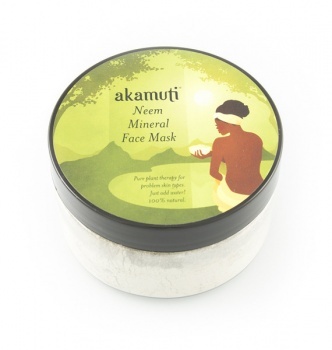 Ideal plant therapy for oily, problem & upset skin types. Apply your clay mask to a clean face. Leave the mask on until the clay begins to dry on your face or starts to feel warm - after about 5-10 mins. Remember that if you leave a clay mask on for too long & it will counteract the benefits. Simply apply the mask to localised patches, wash after 5 mins & re-apply fresh mask to the area. Tip! Mix with distilled tea tree water for extra therapeutic benefits. Please Note: If your skin is in need of serious TLC, it is not unusual that after applying your first clay mask your skin will feel warm and redden. This is good news as it shows the clay is doing its job drawing impurities from the skin. This effect will diminish & disappear completely the more you use the mask. Bathe your face with cool water after use & simply re-apply the clay until your skin settles.